As one of the first LINE-X franchises in the country, we have 35 years of experience helping people protect their vehicles with LINE-X. LINE-X of Omaha has applied thousands of bed liners and we have applied thousands of coats of the LINE-X formula to many other surfaces since our location opened. We believe in treating our customers right. When you call or stop by our location, you will be greeted by a friendly, helpful member of our team. Our job is to help you find the right solution for your needs. Whether you are just in the market for some new nerf bars, or you need a new bed liner or to protect your watercraft with LINE-X, we will find the best solution at the lowest possible cost. When you trust us with your vehicle, we will treat it with the utmost respect. When you get your vehicle back from us, it will look great and it will be ready to handle almost anything you can throw at it. 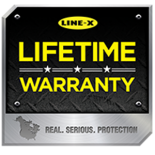 All of the LINE-X protective coatings that we apply are covered by a lifetime warranty. If the LINE-X coating cracks, bubbles, or peels, we will replace it for free. If you aren’t in Omaha and you need to have your bed liner repaired or replaced, you can stop at any LINE-X franchise and they will take care of you. This nationwide coverage is just one of the many ways that you know you can trust LINE-X to deliver on their promises. You won’t find a bed liner that does a better job of resisting scratches, dampening sound, absorbing impacts, or preventing rust and corrosion. Call us today for a quote or to learn more about LINE-X of Omaha and how we can help you take better care of all of your vehicles.